YOU ARE WELCOME TO OLD UMTALI. A warm and friendly welcome awaits you at Old Umtali Guest House. After a peaceful night's sleep, you will be able to start the new day with a full English breakfast. After breakfast, or later in the day, you may wish to take advantage of the guest lounge, Tudor pub, braai/BBQ area and the swimming pool. And in winter, a log fire will add to the atmosphere. 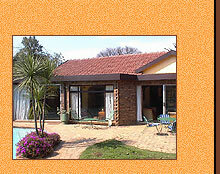 expect from quality accommodation, with a relaxed B & B style. We also offer a 24-hour Internet connection in all rooms. Our guesthouse in Fourways is in a secure boomed-off area. We are ideally situated for business or pleasure, being close to the magnificent Montecasino, a variety of shopping malls and a seemingly endless choice of restaurants and cinemas. We strive to make you feel at home. An amazing entertainment centre, even for those who do not gamble. Get as close to a lion as you would ever want to be! STERKFONTEIN CAVE - "The Cradle of Humanity"
The real answer to that question: "Where do I come from Mommy?"! Day trips arranged. "SOWETO EXPERIENCE" tours available, tailor-made to suit your needs. FOURWAYS SHOPPING MALL, and several other shopping centres; whatever your shopping desires, you can get it at Fourways. MANY, MANY RESTAURANTS to cater for every taste, and every pocket. More than 20 cinemas within a short distance from our Guest House. Our links with the safari world enable us to get excellent rates for your safari experience. N1 HIGHWAY IS NEARBY, with easy access to Sandton City, Randburg and the Airport.